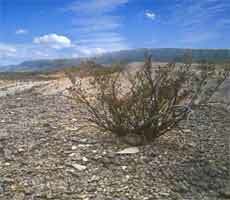 Ariocarpus fissuratus, habitat in the Sierra San Vicente. 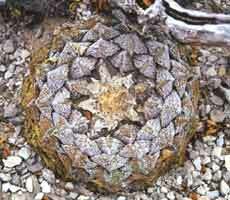 Ariocarpus fissuratus, a large plant completely lacking lateral fissures. This interesting A. fissuratus plant was discovered on a quick inspection of low limestone hills at the northern end of Sra. San Vicente, well within the boundaries of the A. fissuratus v. fissuratus range. Its remarkable lloydii-like characteristics further emphasise that A. lloydii and A. fissuratus are two facets of the same species.